Wisconsin Bench Lobo Tables are solidly built, durable tables that are ideal for art, design, and industrial classrooms as well as studios and creative labs. Proudly made in the USA, they are Greenguard-certified and backed by a manufacturer's 10-year warranty. The heavy-duty 16 gauge steel frames won't sag or sway and have a chip-resistant black powder-coated finish. Each sturdy leg measures 2" × 2" thick. You can adjust the height of the work surface to anywhere between 23½" and 37½". 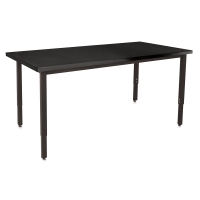 Lobo Table with Chemical-Resistant Top — Offered in four sizes, this model features a 1¼" MDF top with a chemical-resistant, high-pressure laminate finish and 3 mm edge banding. 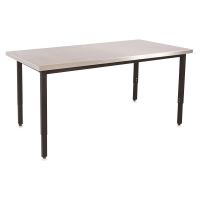 Lobo Table with Stainless Steel Top — This model is offered in the 30" × 72" size only. The 16 gauge stainless top features eased edges and welded, polished corners wrapped over a 1¼" particle board core.